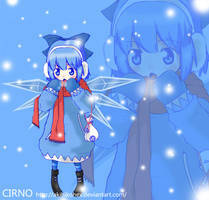 Cirno the ice fairy in Minecraft! AKA Cirno the ⑨ from Touhou Project. Took around 4-5 hours to make, and is made by me, Noob4u. If you liked this pic, please check out my other ones, also check out my journal to tell me what i should make next! Cirno: Eye is the Strongest even in minecraft! Noob4u: Oh really Cirno? Then can u beat that green thing behind u? Baka! Baka! Baka! Baka! Baka! Baka! Baka! Baka! Is the see through stuff clouds? Clouds are neither available nor usable blocks in Minecraft, I'm pretty sure that the transparent blocks you're talking about are ice blocks. 4-5 hours? sum 'em. ⑨.
I have one question.what did you use for the darker shades in the skin? cirno is a genius? am i right? You= the strongest in minecraft? Ow ow ow. All that wool...Would've been a pain to made in survival, really. Thank god Creative mode still exists! Still, awesome job on this one, it's damn accurate even with Minecraft's limited resources! Actually.. I would ask that you try out a one... but I think that might be pushing it..
Aw man... what about ? Woah. Damn great, it took some important time from you thats for sure. AWESOME! She's going to freeze all the servers! to be honest theres already a cirno skin and i was using it while making this LOL u want it i can post it. There already is a Cirno skin? I didn't know that. Then again, I live under a rock when it comes to Minecraft skins. THE STRONGEST MINECRAFT PROJECT EVER. i wish i was pro enough to do this. lol the white piece of land looks almost like an ice ball by her hand! !